04.05.2018 The new GasDetector IR 220 launched by gas detection specialist Bieler+Lang reliably detects refrigerant leakages, thus prolonging inspection intervals of cooling devices. The newly developed long-lasting sensor of the gas detector uses NDIR technology (non-dispersive infrared) to monitor the presence of cooling agents. 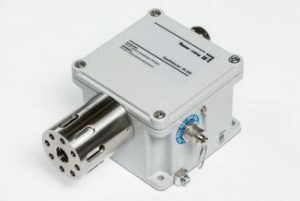 It identifies individual gases on the basis of their unique and well-defined light absorption curve in the infrared spectrum. The gas concentration can be analysed within the optical path. Equipped with its own electronics and software, the sensor provides a linearized and temperature-compensated output which is transformed into a 4–20 mA signal. The instrument can determine refrigerant gases at concentrations between 0 and 2000 ppm, is resistant to chemical toxins, and can be used as a stand-alone solution without further equipment.